As someone who has homebrewed plenty of beer in my life, I am a bit dubious of any claims that anyone can improve a beer’s flavor in just seconds. But I’m also not a Cambridge-trained engineer who specializes in fluid technology, so I should probably give a machine called the Hoppier the benefit of the doubt for now. The machine, designed by the aforementioned British engineers, is a cross between a standard draft beer tap and an espresso machine that they claim will let drinkers customize the flavor of their beer with the hops or other adjuncts of their choice. After painstaking research (and presumably many, many beers consumed), they figured out how to utilize pressure to add hop flavor and aroma to the beer in almost no time at all. The actual method the engineers employed is quite similar to making an espresso: Beer is shot over hops, held in an espresso machine-like fitting at high pressure, then comes out through a tap and straight into your glass. “We have speeded up the dry-hopping process,” project leader Edward Brenner said. “By adding extra hops at the point of dispense, their volatile aromas are as fresh and intense as possible.” Brenner claims the same goes for those hop flavors. 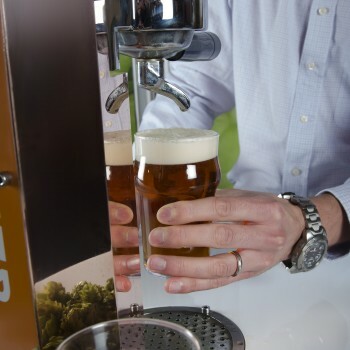 Hoppier goes on display early next month at the Canadean Alcohol Innovation Congress in London, and if it works like Brenner claims, it will probably show up in bars soon enough. The Daily Mail got video of the Hoppier in action, which you can see below.